A worksheet for the future continuous only. 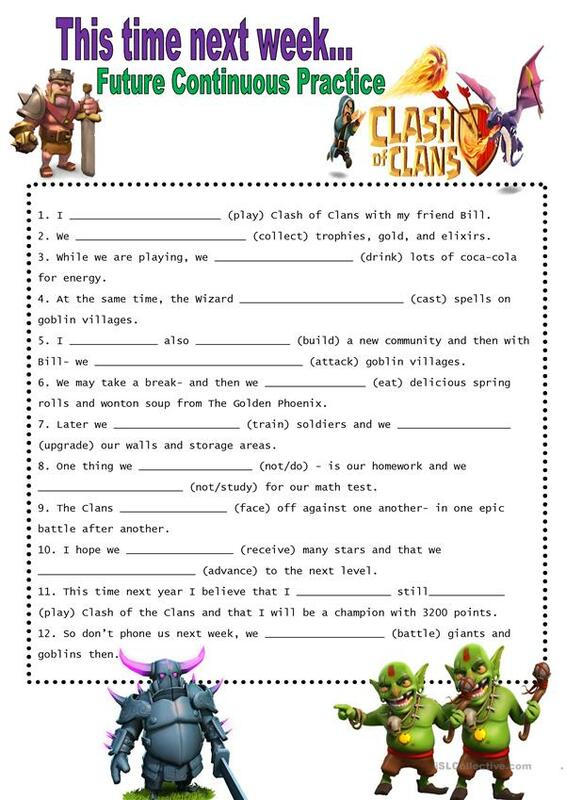 The theme is Clash of the Clans, a popular Internet game. You can edit the names of the students. It's a bit forced to used only one tense, but this was created as a review for a school test. This downloadable handout is intended for high school students, elementary school students and students with special educational needs, learning difficulties, e.g. dyslexia at Pre-intermediate (A2) and Intermediate (B1) level. It is valuable for practising Future continuous tense: (will be V+ing) in English, and was designed for honing your pupils' Spelling, Reading and Writing skills. It features the topic and words of Actions, Computer games and Smart phones, tablets and gadgets.